Just Announced: Santiago, Chile - Sunday, October 29, 2017 at Gets Louder Festival, Movistar Arena. Metal Hammer Golden Gods Award winner and Slipknot co-founding member and key songwriter, Joey Jordison has unveiled plans for his long-awaited return in the form of a new musical venture, VIMIC. The band consists of Jordison on drums, singer Kalen Chase Musmecci, who has toured with KORN as a backing vocalist and percussionist, and Joey's former Scar the Martyr bandmates Jed Simon (guitar), Kyle Konkiel (bass) and Matthew Tarach (keyboards). VIMIC has signed a management deal with Nashville powerhouse CTK Management, where Jordison will reunite with former member of Slipknot's original management team Danny Nozell, and will be represented by United Talent Agency’s Neil Warnock internationally and Tim Borror in North America. Additionally, the band is readying the release of a new album for 2017, which will be released on Jordison’s joint venture record label, with the first video & single to be released in December. Fans can expect more information, along with additional tour dates and music from the upcoming album, in the coming months on www.VimicMusic.com and Joey's new website www.JoeyJordison.com. "It's an honor to be back working with one of the world's best drummers and songwriters. Joey is a metal icon. I look forward to Joey touring globally and reconnecting with his fan base, helping share his new music and talents with the world again," said Danny Nozell, CEO CTK Management. Often referred to as one the best drummers in the world by fans, musicians and media thanks to his unique style, sound and lightning fast technicality, Joey Jordison has, in addition to co-founding Slipknot, worked with some of the biggest selling acts in hard rock and heavy metal, including Metallica, Korn, Rob Zombie, Marilyn Manson and many more. Before his departure from Slipknot in late 2013, Jordison had been quietly struggling with the career-threatening neurological condion acute transverse myelitis, an inflammation of the spinal cord which damages nerve fibers, which ultimately led to Jordison losing the use of his legs. Never one to quit or back down from a fight, Joey overcame the impossible through months and months of rehabilitation, regaining the strength to walk again. He is feeling stronger than ever and is eager to show the world what is possible. "The band members have just arrived to my home in Des Moines, and the energy and vibe is absolutely magnetic. We are ready to bring back our music, showcase our new live shows to the masses, and show our appreciation to the fans who got us here and supported us in the first place. That's what matters, the fans!!! It's been a struggle, but we've overcome it and are ready to unleash. Thank you to all who have believed in us, have patiently waited, and continue to stand by our side. We'll see you soon! Get ready...," said Joey Jordison. Jordison and VIMIC’s first priority is getting in front of the fans, who have been sending letters, approaching Joey on the street and posting on social media asking when they will be able to see the iconic drummer live. Starting Dec. 26 in Jordison’s hometown of Des Moines, Iowa, the band kicks off a world tour. After the short US run, VIMIC will embark on a UK and European run that will kick off at the end of February through the month of March and into April with dates in London, Manchester, Birmingham, Paris, Berlin, Munich, Hamburg, Cologne, Barcelona, Madrid, Milan, Zurich, Tilburg, Copenhagen, Stockholm, Olso and more... VIMIC will also tour Asia, South America, Australia in 2017. Tour dates and ticket links below. 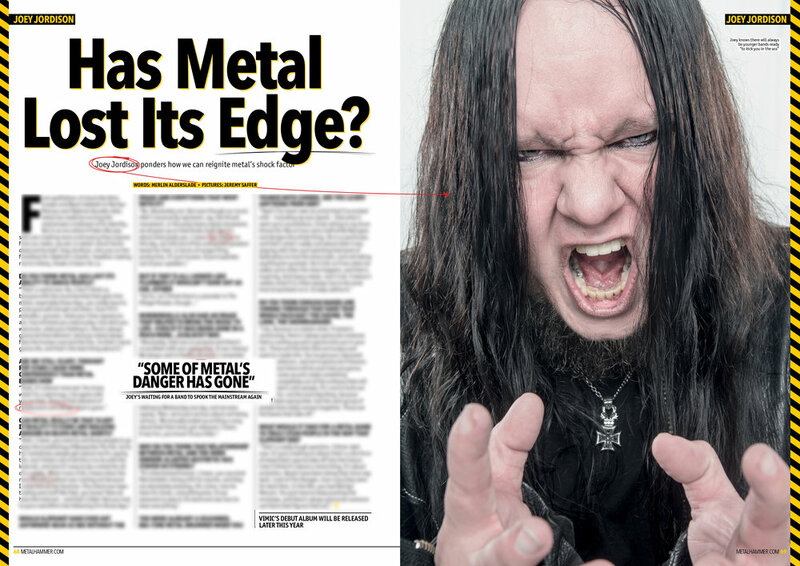 GRAMMY® Award-winning, multiplatinum-selling, multi-instrumentalist, songwriter, producer, and artist Joey Jordison still clings to the same passion that drove him to pick up the drums as a child in Des Moines, Iowa. With a lifelong music obsession, this pure love for the art form continues to define every step of his journey. In 1995, he co-founded metal juggernaut Slipknot and anchored the band behind the kit as a primary songwriter at just 20-years-old. Following the release of their classic double-platinum, self-titled debut in 1999, the band would go on to sell 20 million albums worldwide, garner a 2005 GRAMMY® Award in the category of “Best Metal Performance” for “Before I Forget,” land a #1 debut on the Billboard Top 200 with 2008’s platinum-certified All Hope Is Gone, headline festivals globally from Download to Rock on the Range, and influence two generations of talent. Simultaneously, he co-founded Murderdolls who quickly became a cult favorite across the world, moved 100,000 copies of their 2002 debut Beyond The Valley of the Murderdolls, and achieved acclaim with 2010’s Women and Children Last. Along the way, some of history’s most influential bands would call on Jordison to play drums. In 2004, Metallica sat him on the throne during an unforgettable Download Festival headline set. In addition to playing with black metal icons Satyricon, he toured extensively with Ministry in 2006 and Korn in 2007—galvanizing both with a new energy. Rob Zombie tapped his talents in 2010 for a marathon of touring and an appearance on four songs from the Expanded Edition of Hellbilly Deluxe 2. His drumming became the stuff of legend. Merging a flawless and fiery technicality evocative of underground metal, neck-snapping hard rock grooves, and an anthemic stadium-ready expansiveness, he crafted a signature style that’s as impactful as it is inspirational. Recognized by the industry, he personally graced the covers of Modern Drummer, Rhythm, Metal Hammer, Drummer, Drum!, Terrorizer, Kerrang!, and many more. 2013 saw him launch Scar The Martyr and release a critically celebrated album of the same name. It also proved to be the most trying, turbulent, and tough year of his life. In the midst of a split from Slipknot, the rare disease Acute Transverse Myelitis had overtaken the musician. He spent three months in a hospital bed before a rigorous regiment of physical rehabilitation, therapy, and exercise followed over the next year. Drawing on support from his family and friends, he miraculously beat it. That’s one thing he’ll never stop doing. 2016 represents a rebirth for Jordison. Celebrating this new beginning, Metal Hammer even awarded him the year’s coveted “Golden God” Award, recognizing his lifetime achievement. Maintaining an incredible momentum, he launched his band VIMIC with its forthcoming debut Open Your Omen and extreme metal outfit Sinsaenum with Echoes of the Tortured. Jordison is ready for his biggest musical moment yet.